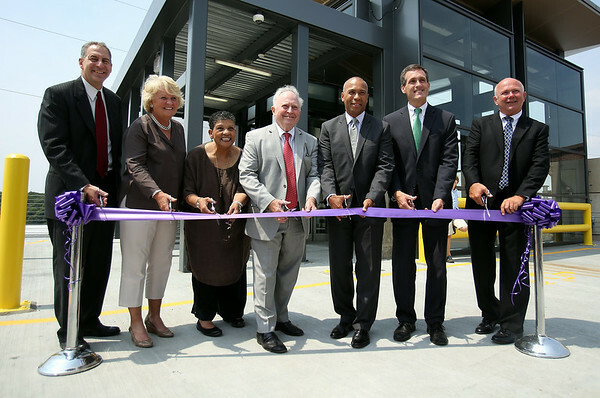 From left: State Representative Jerry Parisella, former State Representative Mary Grant, Beverly Scott, GM and Chief Executive Officer of the MBTA, former Beverly Mayor Bill Scanlon, Governor Deval Patrick, Beverly Mayor Mike Cahill, and Project Manager for the MBTA George Doherty, line up for a ribbon cutting to officially open the new Beverly Depot Parking Garage on Friday afternoon. DAVID LE/Staff photo. 8/1/14.